Canopy tents can be so versatile that you could use it for a variety of reasons. Be it for a picnic trip, a backyard sale or setting up your tent in a fair or market, canopy tents is the ideal choice. They provide shelter from strong winds, harmful sunrays, and moody spells of rainfall, and in some cases, snow! But not all canopies are made the same. Some would give either one of the strength and quality while providing nothing on the other counterpart. And some would give all-around protection. Keeping the differences in our mind, we have decided to compile a list of best pop up canopy tent in the market today. 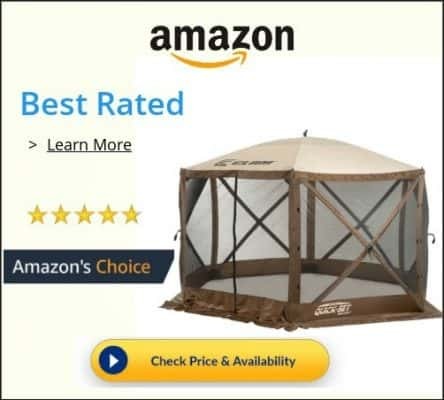 How we’ve chosen this best canopy tent list? We have rated the canopy based on the factors like strength, headspace, and room, shade, fabric quality, additional features, set up, and budget. The canopy we’ve chosen is the best in all the features above. We strongly believe this will help you in making a wise decision before making the purchase. Eurmax has been in the industry for 15 years and they have relentlessly aimed at providing the best quality commercial-grade pop-up canopies at an affordable range. This basic yet reliable Eurmax 10×10 commercial canopy is also one of the offers in their range of canopies. It covers everything that you would need within a budget. This is one of the all time best pop up canopy tent in the market. This Eurmax tent takes less than five minutes for a single person to set up. The time gradually reduces to half if there are two people. It has thumb-lock sliders that spring up and helps in installing quickly. This is what gives it the ‘pop-up’ title in the first place. The telescopic legs also pop out with it and you can set the height of the legs from the 3 settings that it provides. It weighs almost 50 lbs and you also get a sturdy carry bag with wheels which can easily glide on all terrains. This tent is has a full cross truss which is stronger and more reliable than simple pyramid frames. It can take on the pressure from the top and the sides well. This becomes especially indispensable quality when you have heavy winds and rainfall that can sweep away your tent. The frame is made from commercial grade steel and has hammertone powder coated finish that fares better than the aluminum ones and are rust resistant. The legs are square-shaped and stand straight. It provides up to 100 sq. Ft of shade and would be enough for 8-10 people standing under it. Its peak height is 11.1 ft. The cover is made from 500 deniers high-quality polyester fabric. The seams are stitched so that it can seal out water from coming inside of the tent. The fabric is waterproof and blocks 99% of UV sun rays. Also, the fabric CPAI-84 fire retardant certificated. It also has Velcro on its seams to make it easy for you to attach additional wall panel to the canopy. It has amassed 4.8/5 stars and we also would give it the same for the good quality basics it can give under an affordable budget. It has fared well to our expectations and we would recommend you this one without a doubt. ABC Canopies are new to the game but they aren’t amateur. They have well researched what the people would expect out of a good canopy while also keeping in mind budget and frames. They have 10×20 canopy as well as 10×10 with steel or aluminum frames. You only need to assess what kind of tent you would need for your purpose and then go for any tent of their range. This canopy is heavy and therefore, it is recommended that two people should set it up. Then you can easily install it in five minutes or less. It has push slider button that would easily glide your hand to adjust the size of the legs to your comfort. It makes it pretty convenient to set it up. It weighs around 53 lbs and it comes with a roller bag that is equally sturdy to easily move it from one place to the other. And because of this, you would actually want it to use it for more serious and commercial use than a casual one. The frame is full cross truss with powder-coated steel. The joints are secured by nylon composite brackets that evenly distribute pressure without folding up abruptly under pressure. This makes it a good match for places where there can be a possibility of heavy winds and rainfall. It also has central support that would save it from peaking inside. Its peak height ranges from 124”-133” and its clearance is 78”-86” which can pretty much accommodate above 6 ft tall people while giving some headroom to them. It is made of silver solarteck fabric which gives (UPF 50+) protection. This silver coated polyester is 100% waterproof with 300D polyester. This doesn’t let a stray raindrop fall inside of the tent. The panels have a zipper on the side for easy and sturdy installation of wall panels and it has a Velcro on the end of it to secure it firmly on the leg of the frame. It also has a banner loop that helps in making you stand out and be identified easily. They only provide you with canopy top, frame, and a strong roller bag for easy portability. Apart from that, they also offer a 1-year warranty and spare parts for life. But then they do not provide additional weights or stakes. People have given it 4.2/5 stars and we would give it 4.5 out of 5. We have loved the variety of colors it is available in and also how it braves the storm and stands without falling apart. Is it a perfect match? Maybe, but it is close to perfect and hence one of the recommended one in our list. Core has been providing with high-quality outdoor activity tents and gear. Now it has expanded its interest in pop-up canopies and has introduced this 10’x10’ instant shelter. We know that they are focussed on quality and ease in the set-up. Let us see how they fare. Core claims that this would take less than two minutes to set up –and they were right only if you have company. Can you do it single-handedly? Yes but within 4 minutes top. This canopy frame is lighter than the above two mentioned and it has push slider buttons that help in ease in set up. It has 3 leg adjustments so you can set it up at whichever height you please for your purpose. This weighs 43lbs and comes with a zippered wheeled carry bag. Since it is a little easy to carry around, it is suitable for more of recreational use than commercial. But if you want to use it for commercial ones, you can do it too. The frames don’t seem to be too strong to actually take on the weight of serious events but still, it does a pretty decent job. The frame is made from durable steel but it has plastic joints, unlike the nylon ones we had in ABC canopy. It is good enough for mild spells of rain and average winds, but we doubt if it can take on heavy winds and rainfall. The legs of this canopy are straight. It has a center height of 112” and provides 100 sq. Ft of shade to at least 8 people standing under it comfortably. The fabric is made from 150D polyester and is waterproof. Since it doesn’t have central support, it has more chances of water pooling on top of the frame. It provides 50+ UPF sun protection and is also has CPAI-84 fire retardant certificated. It only comes with a canopy top, roller bag, and a steel frame but not with additional weight, stakes or guy ropes. It has scored 4.1/5 stars. We feel it is a little overpriced for the qualities that it has. The frame is not of commercial grade quality but is fit for more recreational purposes. So if you want to take something lightweight for camping trips and picnics, these would be better than the heavier ones mentioned above. E-Z up brand is a reputed and known brand that has rightfully gained its fame. They have been in the canopy manufacturing business since long and have been regularly making themselves better at each feature that they introduce to their customers. They listen to the feedback and work on it to reinvent themselves with every product release. Let us see how this canopy fares. The set up takes almost 3-4 minutes when you do it alone and it would cut short to 2 minutes when you have a helping hand. It has auto slider pull pin technology, which gets initiated when you tug the pin a little. It is pretty convenient to install in beaches and for other recreational activity where you would need some shade. This canopy and frame weigh around 34lbs – the lightest we have carried so far. Also, it comes with a good quality roller bag to carry it around wherever needed. It has a very simplistic frame which powder coated with steel. The frame is made from composite fiber rods, which make it easy to bend and adapt to flowing winds than break away like a poor umbrella. Its slanted legs give it the stability that you would need to have. This canopy doesn’t give 100 sq ft of shade because it is actually installed to 8’x8’ of measurement. So it kind of falls short of 100 sq ft of shade (gives shade up to 64 sq ft). The peak height of this canopy is 9’1”, which is great for taller people to find shade under with some headroom. The canopy has air vents which help hot air to escape when it gathers under the tent. Though they are not advertising it as 100% waterproof, it does a really good job of keeping people under the shelter dry. It is also CPAI-84 fire retardant certificated. But it is best suited to keep the winds away from blowing off your shade. It comes with a roller bag, canopy top, frame and spike kit. They also provide you with 3-years of warranty. People have rated it 3.5/5 stars. Our experience with this canopy was good enough to recommend it. It is a budget-friendly canopy for beachgoers and people who would love to go have some fun outdoors without needing a heavy-duty canopy. Coleman has been a trusted name in the outdoor gear industry. Whatever you need for a camping trip, Coleman would have a quality product for you. And this time they have become more experimental with their offering and have expanded their range with this instant sun shelter. Let us see how this one has fared up to our expectations. The set up takes less than two minutes when you have 2 people to set it up. Otherwise, it will only take you 3 minutes to set it up yourself. Lock the telescopic legs into place and then adjust its height with comfort grip technology. Just when you hear the ‘click’ you can rest assured that you have set it up perfectly. It is lightweight and weighs around 37lbs. It also has a portable roller carry bag, which makes it easy for you to carry it around your next trip to a beach or a soccer game. It is a one-piece frame. The frame may be of metal but the truss connectors are made of plastic. Plastics are not the best suitors in every type of climate. So when you have heavy rainfall or snow, it will have the tendency to break down. It is most suited for tropical climates as it would hold up pretty well to that weather. It provides a little less than 100 sq. Ft of shade and has a peak height of 9’4”. The fabric is made from UV guard material and is water resistant, not waterproof. This means that is will not let the water inside of the tent, but it cannot endure heavy or prolong rainfall. The material is also CPAI-84 fire retardant certificated. It also has air vents in its canopy so that hot air doesn’t get trapped inside of the tent. They give you 1-year guarantee and the best feature about this canopy is that it comes with pre-attached guy lines. And they also provide you with ground stakes. People have rated it 3.9/ 5 stars. We are mildly impressed by this canopy as well. It is because if it breaks down, then you have no replacement parts in place to fix it. You will have to buy a new one. But it is suitable for more tropical weather and climate. These would do fine in such conditions and offer good shade and protection from mild rain. But do not expect a lot out of this item. Caravan has introduced a stunner with this item. This fits the bill and the budget quite easily. They have been striving hard to provide consumers with what they want rather than giving them flimsy frames at expensive prices. This took us 5 minutes to set up when done individually and the time was cut in halves when we had a helping hand to set it up. It has an easy pull pin slider with 5 height settings that make it pretty convenient to set it up faster and to the height of your choice. The frame weighs 48 lbs and it comes with a 420 D roller bag that makes it easier to carry it around. The frame is made from sturdy high-grade steel with powder coated finish. This helps in preventing rust, corrosion, and peeling off. It is a full cross truss frame so it has the stability to endure heavy rain and wind if needed. Water will not pool up on the head of the canopy. It is a straight leg canopy. It provides 100 sq ft of shade with a maximum clearance of 7’2’’ and a peak height of 11”. The fabric is made from durable 500D polyester with 99% of UV protection. This fabric is also water resistant but not totally waterproof. But because its frame is sturdy, it can endure rainfall better than the previous canopy with plastic joints. This includes a roller bag, 4 stakes, and 1-year warranty. This has got 3.8/ 5 stars but we would rate it higher than that. We loved the frame as well as the 5 height settings. Also, they have a sturdy high-grade steel frame which helps in keeping the frame strong in harsh weather. They have also provided with a commercial grade roller bag that would not tear away so easily. They have kept in mind about everything and went on with it. Also, it is budget friendly so we would highly recommend it. E-Z Up Sierra II is another offering from E-Z Up to help people install canopies easily and without much effort. This is one of the lightweight canopies and is the best catch for windy days at the beach. They have clearly stated that it is not ideal for rainy days but rather for more warmer and dry weather. Just set up the legs and let the auto slider push pin to do the trick for you. It is fairly easy to set up than the rest of the canopies. It takes less than 2 minutes for 2 people to set it up. And if it is only one person setting it up, then it will only take 4 minutes but the process is fairly easier than the rest. It weighs only 41 lbs for a 12’x 12’ canopy. It also comes with a roller bag to help it carry it around. The frame is simplistic and is made from white powder coated steel frame with plastic hinges. Since it is made for more recreational use, it does a good job of standing up and creating a little more than 100 sq. Ft of shade. And it has an open cathedral ceiling. As we mentioned before, it gives a little more than 100 sq. Ft of shade and its peak height is approximately a little over 8 ft. The fabric is water resistant and not waterproof. So it cannot endure heavy rain. It has air vents to help with the air circulation. It is CPAI-84 fire retardant certificated. The fabric is recreational grade polyester top with silver UV coating, which protects from 99% of sun’s harmful rays. Not the best for rain and heavy winds. 2-year warranty and a roller bag. You will have to additionally purchase stakes and weight if needed. It has been rated 3.6/5 stars. This is one of the budget-friendly options for beachgoers and people who don’t want anything heavy duty. If your area doesn’t experience much rainfall, snow or wind, then it will be ideal. It will set up in five minutes without further ado and will give you the shade you need. Recommended for more tropical weather and climatic areas. Durable Full truss structure with square shaped legs, sturdier than those cheap Pop Up canopy tents in the market. 500 Denier High quality polyester fabric top cover. To prevent water penetrate from seams, seam are sealed for stitching lines where possible,100% water proof. Durable Carry Bag with extra big 2.7″ diameter wheel, best design and easy to handle even on rough ground. Lawn Garnish Copyright © 2019.